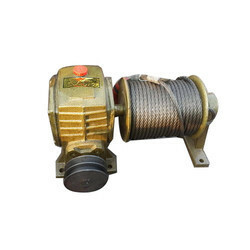 We are largest suppler and importer of Wire Rope Winch. (Windlass) Suitable for Material Lift & Builder's Lift. Being an esteemed name in the industry, we are able to serve our clients with an extensive range of Electric Winch. It is a device comprising a horizontal cylinder turned back by a crank on which a cable or a rope wind is bind. - Safe Working Load: 170 Kg. SAFEX ENERGY manufactures Electric Rope Winches in different configurations. We also manufacture a Hand Operated Winches, Electric Winches. Decision regarding the configuration is made depending upon the shed dimensions and lifting requirements of the client. SUREKA make ELECTRICALLY OPERATED SINGLE / DOUBLE DRUM WINCH with electric motor, gear box, electric/manual brake , rope drum, operator seat, electric control with first filling of lubricants and tested to 25% overload at our testing rig. 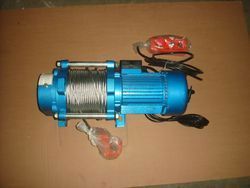 Specifications of Electric Wire Rope Hoist /Kcd Type Multi-Function Electric Winch 1. Electric winch has compact structure, it is economical & easy to install, and wide range of application. The product has the characteristic brake promptly, small volume, light, compact, convenient and easy to maintain.